A rugged, versatile, and cost-effective solution for broadband Internet access that leaves other services in its wake! 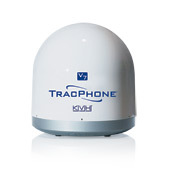 The powerful mini-VSAT Broadband service is available via the rugged, 24" (60 cm) TracPhone V7 antenna. A fraction of the size of standard 1-meter VSAT systems, the TracPhone V7 and its fully integrated below-decks modem and control unit offer easy connections to shipboard networks, fully stabilized tracking, a remarkable reduction in the cost of hardware and installation, and all with no compromise in performance! The revolutionary TracPhone V7 and mini-VSAT Broadband service makes your vessel more productive – you can send and receive e-mail, access company networks, download chart updates, use the enhanced VoIP telephone service for ship's business and add the optional crew calling system to help your crew stay in touch with their loved ones. This new product and service, developed by leaders in the satellite communications industry, is exactly what you’ve been waiting for – it's what broadband at sea was meant to be. Customers who demand an enterprise-grade fax solution should take advantage of KVH's optional accessory - the UCH-250 Fax Server. In addition, when you activate your system, you also get FREE access to KVH’s Velocity™ Acceleration software. When installed on your PC, this software optimizes and speeds up your data connections via the mini-VSAT Broadband service. If you need to switch easily between multiple TracPhone satellite communications systems, KVH also offers an optional Service Selector. This simple solution allows you enjoy the benefits of both the mini-VSAT Broadband and Inmarsat services when you need them. Spread spectrum satellite technology previously only available to the military and business jets offers seamless regional roaming and is ideal for heavy data use. 85% smaller by volume and 75% lighter than 1-meter VSAT antennas so it’s easier and less expensive to install and maintain. Data rates as fast as 512 Kbps for ship-to-shore uploads and 2 Mbps for shore-to-ship uploads. Rugged, commercial-grade design tested under vibration and high/low temperature extremes that exceed commercial industry standards. Choice of always-on, fixed price or per-megabyte subscription plans.